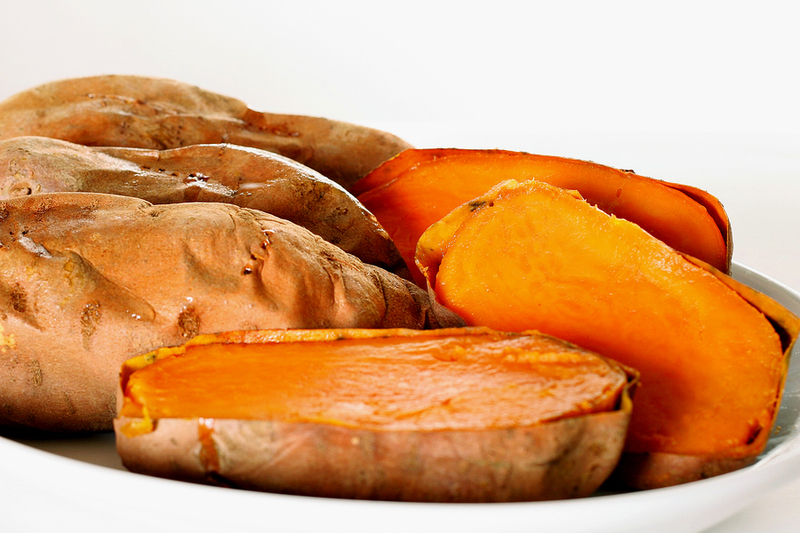 Sweet potatoes are your healthy eating and time-saving secret weapon. If you are eating healthy to ease your digestive problems, lose weight or regulate your blood sugar, sweet potatoes should be in your everyday eating armoury. Not only do they pack a massive nutritional punch, they can save you hours of time in the kitchen if you are clever. Why are sweet potatoes so special? A sweet potato will give you a very healthy serving of Vitamin A, an anti-oxidant essential for your immune function, healthy eyes, teeth and bones. The many phyto-nutrients that give sweet potatoes their vibrant colour also play a key role in reducing inflammation in the cells of our bodies. And since most chronic diseases are caused by cell inflammation, eating anti-inflammatory foods is a really smart move. Add the fibre of sweet potato into this mix and you have an all-round digestion and blood-sugar friendly ingredient that provides sustained energy with satisfying flavour. And what a flavour! How can something so sweet be so good for us, huh? Well you’ll have to ask mother nature about that, but if you are reducing sugar in your diet or battling cravings, the sweet potato is truly your ally. Adding in wholefood sweetness to your daily diet will help to curb those sugar cravings and regulate your blood sugar. The fact that this is a root vegetable means it has very ‘grounding’ properties, helping to calm and comfort us, which further reduces those panicky ‘need sugar now!’ moments. How can sweet potatoes save you time? Sweet potatoes are perfect for batch cooking in advance and storing for use all through the week. There are so many ways to use cooked sweet potato you need never get bored and they will be your ally in cutting down processed grains and starchier carbs. Cook 8-10 sweet potatoes all at once. I personally do not pierce my potatoes, preferring all that goodness to stay inside the skin, and I rarely get a burst. If I do, it isn’t the end of the world. Place on a baking tray and bake in the oven for 45-60 mins depending on size of potato. They should yield to the touch when cooked through. Use one or two of the potatoes immediately for your next meal. Allow the rest to cool slightly before handling. Then cut them in half with a sharp knife. Scoop off the cooked flesh, leaving about half an inch of it on the skins. Store all the scooped flesh in a container, mashing it with a fork in the container. We will be using this flesh for further recipes. It can be refrigerated for up to 5 days and also freezes well. Keep the skin halves too! These are great to use for loaded potato skins – see the recipe link below. They can be refrigerated for up to 5 days and they also freeze well. I freeze them in pairs in freezer bags. They take only about 30 mins to defrost. Do you batch-cook sweet potatoes? Comment and let me know how you use them! Do you know someone who would love this advice? Please SHARE and spread the inspiration!